You’re late! You’ve failed! It’s over! These words have stopped making sense anymore. The moment that is about to happen brings umpteen new possibilities which when utilized favorably can even turn the tide. There is no such word as ‘setback’ because like a spring one can recoil at any time undoing the stagnancy and inventing major breakthroughs. Going back to ancient times, the forgotten history books, or the pages of our scriptures, and even knowing the life stories of the determined faces around us we find numerous accounts where men and women have defied age and time and embraced success. A full stop always do not signify an end many a times it is the beginning of a new sentence. We oftentimes come across names like the youngest entrepreneur Advait Thakur (founder of Apex Infosys, India), wonderkid Kautilya Pandit (known as the human computer), medical genius Akrit Jaswal (operated an 8 yo girl when he was only 7), grand master Chithambaram Aravindh (who won the U19 Chess Championship at 12), youngest matriculate Sushma Verma, Ayesha Aziz who's selected by NASA as one of the youngest space trainee. History too talks about child prodigies like Mozart, Madam Curie, Pascal, Ramanujan, etc. These are achievers who’ve made their mark even before they reached their teens. And when we hear about them we are definitely filled with awe but at the same time it makes us feel as if we have missed our time by not accomplishing anything in life other than earning our daily bread. Our biggest problem is we look at success from a very incorrect perspective. Age and time, in no way define success. Success depends on the doer and their efforts. If President Obama retired at the age of 55, Trump took over the White House office at 70, at an age most people would withdraw to an armchair life. The standard norm of life that we try to follow does not always fit every individual. Indians follow the four age-based life systems or ashrams which begin with Brahmacharya (Student life), followed by Grihastha (Householder), Vanaprastha (Retirement) and Sannyasa (Renunciation). Take for example J. K. Rowling, her rags-to-riches story is equally inspirational as her Harry Potter series have been. She published her first Harry Potter book after rejection from 12 publishing houses, at the age of 32. She was 42 when she completed the series. Trump and Rowling’s are not the only stories. One finds thousands of instances across the world. Mohandas Karamchand Gandhi began his Struggle for Independence at the age of 46, was adulated as the Mahatma and went on to become the Father of the Nation. Harry Bernstein who wrote the famous book, The Invisible Wall: A Love Story That Broke Barriers, was 93 when he started writing his book and published it when he was 96. 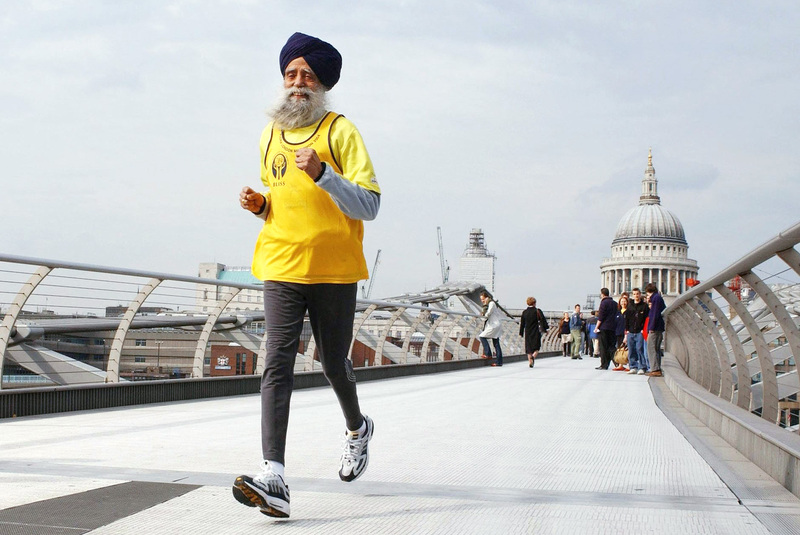 British centenarian Fauja Singh took running seriously at 89 and ran a marathon at 92. Defying all criticisms, Susan Boyle started her singing career at the age of 47 and managed to have UK’s best-selling album of all time. Harboring self-doubt and letting others dictate your terms are the only blockages of one’s path of progress. Stan Lee, creator of Spider-Man, was 43 when he began drawing his legendary superheroes. Julia Child didn't even learn to cook until she was almost 40 and didn't launch her popular show until she was 50. Jeff Bezos launched Amazon at 31. Then there are success stories of people who made major career changes much after they have crossed their prime, and yet succeeding in them. Arnold Schwarzenegger became the Governor of California at the age of 56 transitioning from a world champion body builder in his 20s to award winning actor in his 30s and joining politics in mid fifties. Colonel Sanders was 62 when he franchised KFC. Ray Kroc bought McDonald at age 52 and grew it into world’s biggest fast food franchise. One of the world’s largest clothing chains, the Gap store was first opened by a naive couple Donald Fisher, who was 40 at that time, and his wife Doris. China’s richest man Jack Ma launched Alibaba Express when he was in his mid forties. Boman Irani made his big break at 44 with Munnabhai MBBS. Suhasini Mulay found the love of her life at 60 and married him. Reh Jaay Sab Dil Thaam Kar O Pyaare, Duniya Mein Rehna Hain Toh Kaam kar Pyaare! Always remember, there are no failures, only quitters.